Allie has been arrested three times in the last year. Her brother has run away. Her parents don’t seem to care about her. With her latest arrest, the last straw, they send her away to Cimmeria Academy, a boarding school which she expects to hate. She finds herself liking it there and making friends, but all is not as it seems on the surface. Cimmeria has secrets, but no one is willing to tell her what the truth is. C.J. Daugherty’s Night School is the first novel in a new young adult series. Set in south east England and a mystery above anything else, it is a change from the recent slew of paranormal young adult fiction. The story is gripping as Allie begins to wonder what is really going on at Cimmeria, and begins to slowly unearth small pieces of information. Very little is revealed about the mysterious Night School to which advanced students belong, and indeed even having finished the novel I can’t definitively say there is no paranormal element to the series. In Night School itself there is nothing of this nature, but there is still so much to be revealed that I can’t say there will not be in future novels. I have to admit I expected a paranormal or supernatural storyline. 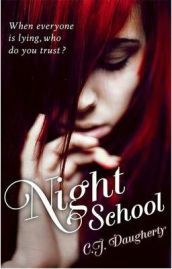 The title of Night School and the cover image both have rings of the current trend towards this in young adult fiction. I enjoy this type of fiction, but I was not at all disappointed to find nothing of the supernatural in Night School. It is a gripping and sinister mystery, despite the lack of revelations leaving us largely in the dark about the real motivations of Cimmeria, and despite my enjoyment of young adult supernatural fiction, I actually found myself viewing Night School as a breath of fresh air. Due to the sheer volume of paranormal, supernatural or fantasy fiction out there at the moment, much of it misses the mark and leaves you disappointed. Night Schooll is simply a mystery story, and not a very straightforward one at that. The mysterious of the characters and their Night Schooll secrets seems to hint towards the paranormal, but I suspect the series is of the thriller genre, possibly with something of a “Big Brother” theme given the hints of an all-powerful, all-controlling organisation outside the school. Daugherty’s writing is straightforward and to the point. The novel is rarely over-descriptive, and the use of the third person means we are not subjected to pages and pages of teen angst. Allie is a good lead character, a normal girl with problems who we can all identify with. She is not perfect but she is also not so dysfunctional or the like that she is unrealistic. The setting of the novel being a school is perhaps the one thing which will put off adult readers. We all read our share of school stories when we were young, from Malory Towers to Sweet Valley High, but this may not be something that many will want to revisit. Yet the school setting is not overbearing, and neither is the teenage style of the novel. Its intended audience is young adults, but the style is mature enough to be accepted by adult readers. There is little teen-speak, and a minimum of pop culture references – in fact it doesn’t really go further than Allie bemoaning the loss of her iPod and laptop in Cimmeria’s technology-free environment, but wouldn’t we all? It may seem like I’m giving a negative picture of Night School, what with the lack of information given in this first novel, but really it is a gripping and absorbing story, full of intrigue and suspense. I for one can’t wait for the second novel, due for publication in January 2013; recommended for young adults and fans of young adult fiction alike. Many thanks to Atom (an imprint of Little Brown) for providing a review copy of Night School. No Comments on "Night School"